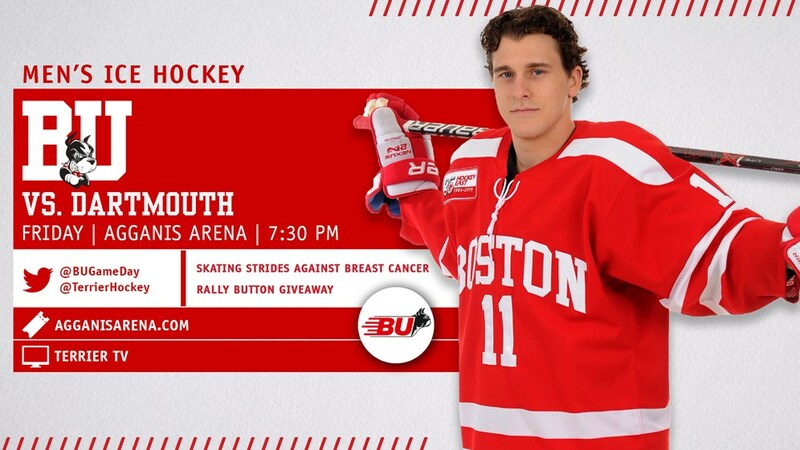 Terriers close out first semester Friday night, hosting Dartmouth in a 7:30 p.m. start at Agganis Arena. The game will be live-streamed on TerrierTV on Stadium. The Big Green is coming off a pair of losses at the hands of cross-state rival New Hampshire. Dartmouth is led by junior Will Graber with 9 points, freshman Drew O’Connor (8 points) and sophomore Quin Foreman (7 points). Junior goalie Adrian Clark brings a 2.58 GAA and .911 save percentage. BU’s offense is led by co-captains Dante Fabbro (13 points) and Bobo Carpenter (12), along with Joel Farabee (10), Patrick Curry (9) and Shane Bowers (8). Carpenter (with three goals in the Lowell series), Farabee and Jake Oettinger were name to last weekend’s Hockey East Top Performers List. Oettinger, who stopped 63 shots in the series against the River Hawks, has a 1.99 GAA and a .941 save percentage over the past 10 games. 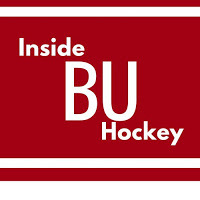 This week's episode of Inside BU Hockey features Bernie Corbett's interviews with Head Coach Albie O'Connell and freshman forward Joel Farabee, who had three points in last Friday's game against Lowell and who will head to U.S. Junior National Team camp in Everett, Washington, following the Dartmouth game. 2019 recruit Robert Mastrosimone scored a pair of goals and added an assist to lead Team USA to a 7-1 win against Switzerland in the World Junior A Challenge in Bonnyville, Alberta. Mastrosimone, who skates for USHL Chicago and had joined the NTDP U18 for their recent Five Nations Tournament win, is on the cover of this month’s USA Hockey Magazine with a profile inside. Goalie Drew Commesso, a 2020 recruit, backboned a pair of wins (7-2 over Slovakia and 3-1 over Switzerland) for the NTDP U17s in the Four Nations tournament in Plymouth, Michigan. In the two victories, the former St. Sebastian’s netminder has 1.51 GAA and a .929 save percentage. Team USA takes on Russia on Friday. A senior at Lawrence Academy, 2020 recruit Braden Doyle, who skated in the All-American Prospects Game in September, will play a season of junior hockey next year with USHL Dubuque. 2021 recruit Danny Zhilkin scored the game’s first goal in the GTHL Top Prospects Game Tuesday night in Toronto. His team, Team Graves, won in overtime, 4-3. Fellow 2021 recruit Roman Schmidt skated for Team Clark. Evan Rodrigues scored an unassisted goal in Buffalo’s 3-1 win against Arizona. Jack Eichel recorded his 29th assist for the Sabres. Alex Chiasson tied a career-best with his 13th goal in Edmonton's 5-4 overtime loss to Winnipeg. Nick Bonino scored his fifth goal and assisted on the overtime winner in Nashville's 4-3 victory against Vancouver. Earlier in the week, the Coyotes’ Clayton Keller returned to Agganis Arena where Arizona practiced before their game against the Bruins. Charlie Coyle scored his fifth goal in Minnesota’s 7-1 rout of Montreal. Colin Wilson scored his eighth goal in Colorado’s 6-4 loss to Edmonton. Jesse Compher’s seven points (2G, 5A) in the Terriers’ sweep of RIT earned her recognition as Hockey East Player of the Week and the NCAA’s top star.The sophomore center leads BU in scoring with 31 points (11G, 20A) in 16 games.